This game is full of fruit variety. Anyone who likes warm season and who can not wait to taste fresh gifts of nature, can please themselves with gambling machine from Pragmatic Play called Fruit Slots. Bananas, cherries, watermelons, lemons and other valuable symbols will reward the user with a positive charge of energy. In this Fruit machine, there are three drums and five lines with the ability to bet on each from 1 cent to 1 dollar. In order to start the game, player needs to prepare the following parameters: set the desired number of lines, determine the size of the bet on each line. Combinations will consist of several characters, standing in a row along the line and will bring cash payouts only in those cases that are indicated in the table of rules and payments. All actions are performed with the buttons Add Line, Bet +/-, Rotate, Auto Game, Max. Rate. The greatest prize will bring a combination of three sevens on the play line. This set of characters is estimated at 500 bets. Also, on the reels are Bar icons and various fruits that do not bring significant winning, but make the game process more diverse. The game does not provide Wild symbol and Bonus game, but Scatter performs its functions, adding favorable terms of its presence. The cherry symbol, falling on the 1st or 3rd reels, brings the coefficient x2. In case if the picture with the cherry appears on the second drum, then it can bring the winnings only in case if this picture will appear more than one. The watermelons, lemons or bananas bring the coefficient from x15 to x25 on the active line. Bar is a highly paid symbol and, depending on the combination, can multiply the bet by a number from 50 to 125. The seven red color is the most profitable symbol, and, as previously mentioned, in a combination of three signs gives the coefficient x500. This is a classic, loved by many developers, the theme of fruit decorates the drums and positively affects the player. Thanks to the Russian-language buttons, the management proceedings do not take much time, and the quality of the animation is really pleasing. Pragmatic Play done great giving to users excellent version of the fruit machine. The new colorful fruit apparatus was undoubtedly success online game. Fruit Machine successfully became a replacement for its predecessors, which correspond to it on the subject, but losses a little on its parameters. 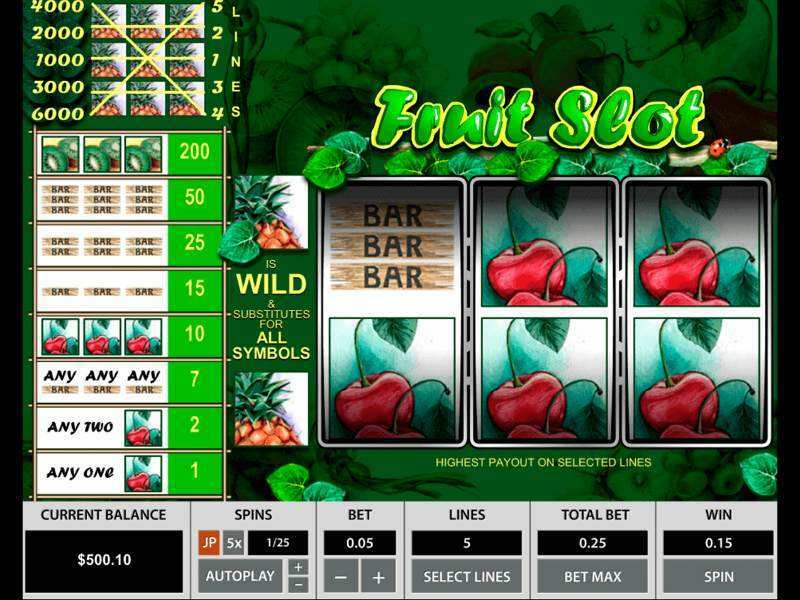 Thanks to high-quality animation and ease of operation, Fruit Slots has advanced its invention, putting “fruit” to a new level. Therefore, this slot is a chance to earn real money in the most delicious way. Each professional gambler or beginner has to try this juice fruit and discover the level of his luck and success. This game has everything for those who prefer getting money and enjoying the process of earning that goes in such an interesting and entertaining way! 0 responses to "Fruit Slot"